The Highlead GC20618-2D is a twin needle heavy duty walking foot lockstitch machine with automatic thread trimmer. It features a heavy duty triple feeding action by way of: bottom feed, needle feed and walking foot top feed (compound feed). These three different feeding components combine together to give a positive feed action which is well-matched with heavy or bulky material & fabrics. It is fitted with 2x large vertically mounted hook & bases which offer increased capacity for heavy duty sewing threads. The GC20618-2D model is equipped with a automatic thread trimmer which is mounted under the needle plate for quick & accurate cutting of thread at the end of a sewing cycle. 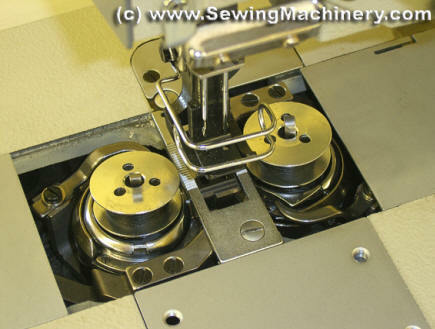 This saves considerable time when compared with manual cutting of threads using scissors etc. The thread trimmer is electronically controlled and uses electric impulse solenoids to move the cutting knives. The application of needle bearings for the arm/hook shafts and an automatic pump driven oil lubrication system combine to make the GC20618-2D quiet, smooth running, durable and reliable. The position of the needle is controlled by an electronic needle position motor & controller. This will automatically put the needle in an UP or DOWN position (selectable) at the end of a sewing cycle: reducing the need to use the manual hand wheel. 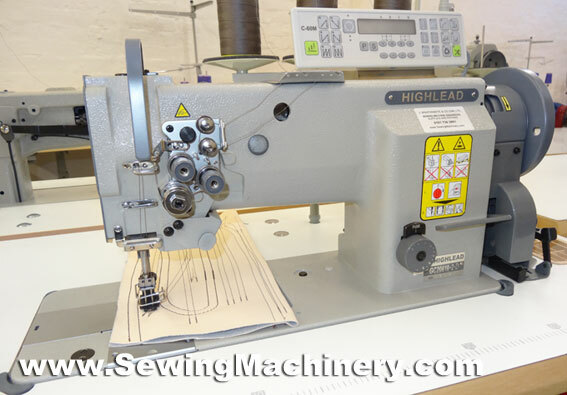 The Highlead GC20618-2D is a feature packed twin needle heavy duty machine and as well as compound feed (bottom feed, needle feed & walking foot) and automatic thread trimming; it comes as standard with programmable auto back-tack, auto reverse, knuckle quick reverse and built in stitch program module. It is suited to sewing, for example, car seats, general upholstery and leather articles, belts, canvas, tents, awnings, handbags, outdoor wear, camping goods etc.